Turn That Sound Upside Down! It is an outrageous fact of life that songs can easily get stuck in your head. Even when it is a song you love, eventually, after enough of a while, you begin to go insane. You might even begin to hate the song in much the same way that when you binge on a favorite treat, you become ill and can’t take the taste for a good long time. This is certainly terrible, to see something you love turn into poison, but it isn’t nearly as bad as having a song you already hated to begin with get stuck in there. It is a form of torture. There is no silver lining. Terrible lyrics set to a criminally catchy tune will rake at your very being until it is raw and threadbare. You tell everyone of your tragedy, and they understand. We all understand. We’ve all had it happen to us. Some people call these catchy songs “ear worms,” a fitting name that reminds you of vile parasites draining you of your essence. It’s true. This music wriggles into your brain and eats holes in there. 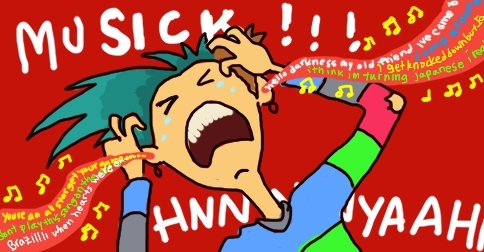 There are probably as many remedies for ear worms as there are for hiccups. Listen to another song, listen to the offending song, put a pillow over your head and scream, scream until you hurt: all with varying results. Well, I have happened upon a new method. Now, this might only work when the song caught in your head is evoking a mood in you. Have you had that experience? When the song looping in your mind is one that even on a happy day, even with just one listen, will bring you down. Maybe for the rest of you there are other strong emotional songs that get caught on repeat in your head, but mine usually deliver depression, despair, or crippling ennui. This happened to me just yesterday. I realized I had been humming “the Sound of Silence” by Simon and Garfunkel all morning, and that mysteriously, my emotional well-being was simultaneously taking a slow nosedive. I decided to take action. We know the instructive phrase to “turn that frown upside down” – well by golly, I intended to turn the whole song upside down by replacing the old downcast lyrics with new words that brought hopefulness and joy. 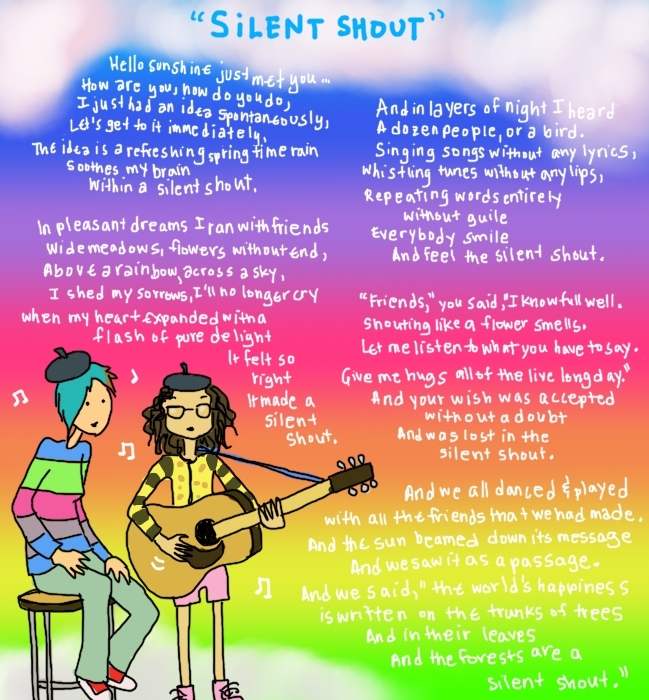 The song is very much still in my head, but at least I now associate it with sunlight and good cheer! I assume this process must work for every song that exists. Right now this method has a 100% success rate! Now, here is where I would include a video of myself performing a chillingly beautiful rendition of my version of the song. However, it is a grim fact of life that I am not any sort of musical talent. Not even a little. I cannot even hum with any sort of talent – and it requires no talent at all! So I have drawn out my lyrics visually and invite anyone out there to record this song and give the world a little bit of happiness.